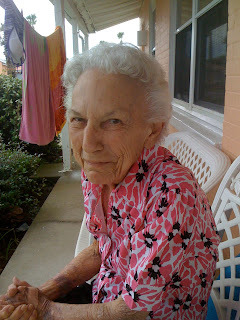 Blogger's Note: As you can see, this post was written several months ago, before my sweet Grannie died. As I was looking through my posts to see if I had one that would apply to the (in)courage link-up today, I knew I would find one about my grandmother, for I am eternally grateful for everything that she did for me. I am forever grateful to Jesus that He put her in my life, that He used her light to guide my path in so many ways. Last night, in my dream, I fell apart. I was in Florida in a house where all my relatives were gathered. All except Grannie, who I knew was in another house somewhere. I asked myself, What am I doing here with all these people when I should be with her? I immediately vacated the premise and rushed to where she was. When I got there, I broke out into all kinds of apologies. I am so sorry I wasn't here. I am so sorry I wasn't spending enough time with you. Please forgive me -- I came as soon as I could. And she looked at me with this look like Of course you did, Sweetie. Don't worry about it. Come here and give me a hug. Bless your heart, you are so busy with the girls and your jobs and everything else. There is no need to apologize. I love you. I just laid on her couch with her and cried and cried and cried. My champion who lay dying was still championing me, someone who, in her eyes, could never do wrong, who was easy to love, who was worth everything she had ever given to her. It is an amazing feeling to be loved like that. It is frightening feeling to continue on life without that love. In reality, those who are with me often (and even not so often) know that I make hurtful mistakes and that I have moments when I am not so easy to love. I know that my grandmother knows that I am not perfect -- she is not delusional by any means. But she fights to help me believe that I am something special, that God is accomplishing His plan through me, and that He hears my prayers. It's not that other people don't do this for me, too. I am so blessed to have incredible family and friends who daily encourage me and spur me on. It's just that she has been doing it for almost 32 years, every single time, without fail, without prompting. I didn't realize how much she supported me emotionally until I realized that the support would one day soon be gone. I think this is one of those thoughts that has been churning in the back of my mind, but just now is coming forth to conscious thought. I have had to fight through a fog and not let myself slip into uncontrolled grief. As I reflect on the past few days, I have realized that it has taken a lot of energy to care about things about which I would normally be so vigilant. Oh, we spent how much money at Home Depot? I'll figure it out somehow. Oh, that was my second rice krispy treat? In one sitting? Oh well. The hope in all of this external processing is that I know that Grannie's love for me is an earthly representation of Jesus' love for me. He is my ultimate Champion and He has defeated the very thing that will take her away from me -- death. The other hope, that just came to me, is that I can carry on her legacy. Unfortunately, I am not as gracious or forgiving as she is naturally, but I can, by God's grace, get over myself and focus on those around me and what they truly need. I can look outward instead of inward. I can love unselfishly, without reserve, with an encouraging word ready to give to whomever may need it. And in this way, she will never die. She will never leave me. She will live on in this world through love, kindness, and grace. You, Grannie, are a champion. Oh, what a precious post. What a blessing to have someone who loves you so much! Oh my goodness Jennifer! What a beautiful tribute to our wonderful Grannie! I wasn't expecting the picture at the bottom. When I saw it I burst into tears, remembering her as a healthy, beautiful person. (never mind I was in the office, but oh well they are used to it). Anyway, what a great writer you are and a wonderful daughter as well. Your Grannie is a beautiful person, I can tell by just looking at her picture. Your tribute for her touched my heart. You are blessed to have her in your life. I'm sure she is blessed to have you too. God bless your heart for being an honoring daughter. Thank you also for joining me at Tea Talk this week. I remember having a psychology professor that said that even though people pass through our lives through death and geographic displacement, the relationships still survive. Whether we like it or not, everyone we meet has the potential to impact our lives forever. So, don't be frightened at the loss of love. It will always be there. Consequently we can have this same impact as well; positive or negative. In this sense it's a big responsibility, just being alive. As per our conversation earlier, we have been profoundly blessed to have been born into a family that is rife with people that care...no matter what. Like most human beings, I find it difficult to keep things in perspective at times. It's a good reminder to know just how lucky I am to have all of them...you included. Keep your chin up...she's going to be with us for a long, long time...I promise. Oh, my goodness, I'm wiping tears as I write this. What a precious entry and beautiful tribute to your Grandmother. Yes, you will fill such a void when she is gone, but as you said, her memory will live on forever and you have the blessed assurance of being reunited with her one day because of our resurrected Lord. Easter blessings to you! What a wonderful tribute. I know just how you feel. My Gram has been a steady force for me for 36 years, and a model of grace and contentment. I loved seeing the photo at the end of your post. Philippians 1:6 says "being confident of this, that he who began a good work in you will carry it on to completion until the day of Christ Jesus." I too am not as gracious or forgiving as I should be and especially in relationship to my inlaws. I too need to get over myself and again try to treat them as I would like to be treated, not as they treat me. Like you I too need to look at my grandmother and the legacy she left as a hospitable and loving person who never gave up on anyone and never said a bad word on anyone. Love someone who lost her grandmothers way to early. Ah, the unconditional love of grandmothers...I miss mine too. But when she left the earth, I felt heaven draw so close. And I prayed that I could be like her. With God all things are possible. I loved reading about Grannie. Blessings.